Gout medication names are at the heart of your gout treatment plan. In my first gout treatment plan template, I took a general approach to gout medication. Therefore, I rarely mentioned specific gout medication names. Now, I am looking more closely at specific gout medications. This is mostly prompted by discussions in the gout forum. The discussion about Long term effects of colchicine is especially relevant. We are discussing colchicine during uric acid lowering. In my general gout treatment plan, we consider colchicine mainly in Which Gout Treatments for Pain Control. However, we cannot ignore the fact that Colchicine For Gout is best used in conjunction with a uric acid lowering treatment plan. This ensures that colchicine is only used as a short term gout medication. Long term use is generally unsafe, and must be carefully monitored by medical professionals. Therefore, it is best if you are familiar with the principles in Which Gout Treatments for Uric Acid Control. As you can see, there are many principles to consider in your gout treatment plan. 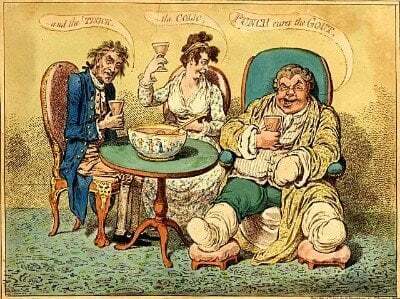 These principles affect every gout patient in different ways. Your doctor should guide you on the principles that apply most to you. That way, you can be sure that the gout medication names that you are using are right for you. I can also help you with gout medication names in the gout forum. Be clear. In this plan, you take colchicine during the first weeks or months of uric acid lowering treatment. You do this to reduce the impact of gout attacks during the first two periods of your uric acid lowering plan. 2. What to expect from colchicine? Do you want colchicine to play it’s part in preventing gout pain, or minimizing it when it happens? In Kevin’s case, we are considering colchicine to prevent gout pain. This is the usual starting point with colchicine during uric acid lowering treatments. 3. How long will you take Colchicine? When I took colchicine during uric acid lowering treatment, I got clear advice. My doctor recommended taking colchicine as a preventative at first. My preventative dose applied for 2 weeks whenever I changed allopurinol dose. Then, I switched to taking colchicine as required. Don’t worry if you haven’t planned this. An important benefit of my gout treatment plans is flexibility. You can make this decision in step 7 if you wish. 4. When will you take Colchicine? Some doctors recommend 2 colchicine per day. Others recommend 1 colchicine per day. The safe maximum is 2. Colchicine works by limiting your immune system. If you are like most people, this happens most frequently at night. Therefore, most people should take 1 colchicine at bedtime. If you are taking a second colchicine, this would normally be 12 hours apart. 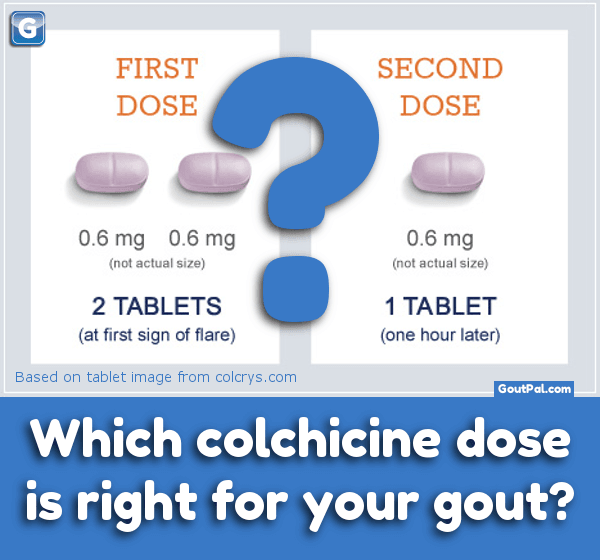 If you are experiencing gout pain, you can take the second colchicine earlier. If your attacks tend to happen more at different times of day, adjust the timing. 5. Does colchicine need help? Colchicine only limits inflammation spreading. It does nothing for existing inflammation or pain. As I discussed in my general gout treatment template, you might need to support colchicine with other forms of gout pain control. As you progress through your treatment plan, you should record your gout symptoms. See the general template for more help on this. As colchicine affects your immune system, you should ask your doctor to replace it if you are exposed to infections. Be aware of the points that Linda made in the aforementioned ‘long term effects of colchicine’ discussion. 7. Which Colchicine treatments are best? You can see that there is no set dosage for colchicine. Remember though, there is a safe maximum. You should expect to change your colchicine dose as your uric acid control improves. This depends on your unique situation. Never continue a colchicine dose for more than a month without reviewing it with your doctor. Generally, you will become less reliant on colchicine as your uric acid burden reduces. Specifically, this depends on your monitoring of gout symptoms and uric acid levels. I will do more specific treatment plans for different gout medication names. I will select them as they arise in the gout forums. Whichever you use, I can help you get the best from your doctor. Use my gout forums to ask what questions to ask your doctor about gout medication names. Also ask for help to understand your doctor’s responses. To get personal help on any aspect of your gout, please ask in my gout forum now. Stay safe - use colchicine short term during uric acid lowering treatment. Decide phasing of preventative and 'as-required' doses. Log gout symptoms and improve colchicine treatment accordingly.